Chinese handset maker Huawei is one of the biggest smartphone makers in the world, especially thanks to its sales in the Mainland. Although the company is not present in several important markets, the sales in China brings Huawei a big chunk of its profits. The next high-end smartphone Huawei plans to launch in Q2 2015 is P8, the sequel to Huawei P7. However, if you expect to see the Huawei P8 at this year Mobile World Congress trade fair, then you might be disappointed to hear the smartphone won't be officially unveiled until April. This means that there are still two months until the P8 will be officially announced during a dedicated event confirmed for April 15. The first details on Huawei P8 leaked a few weeks ago when a prototype unit has been tested in AnTuTu and the specs leaked online. 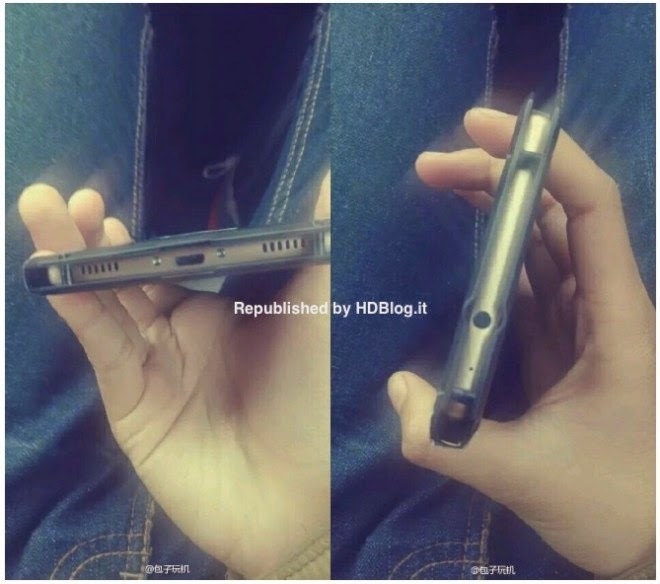 Now Italian blog site AndroidHDBlog has published the first live pictures of the Huawei P8, though the smartphone is encased in a special case with which most of these prototypes are coming to hide their design. Still, we have noticed the Huawei P8 will come with microUSB and 3.5mm ports, as well as stereo speakers that seem to have been placed on the bottom side of the smartphone. Other specs of the P8, which might or might not be confirmed by Huawei when the device goes official, including the company's proprietary 2GHz octa-core Kirin 930 processor, as well as 3GB of RAM. The smartphone is also expected to pack 64GB of internal memory, but there might not be microSD card slot included in the P8. On the back, Huawei P8 will pack a 13-megapixel photo snapper, while in the front there will be an 8-megapixel camera for selfies and video calls. Huawei stated numerous times that it will not launch smartphones with 2K displays, which is why we expect the P8 to feature a 5.2-inch capacitive touchscreen display that supports full HD (1080p) resolution. Obviously, the smartphone will be powered by Android 5.0 Lollipop and Huawei is expected to launch a lite version of the P8, but more details will certainly be revealed on April 15.